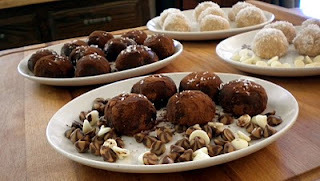 These booze balls were try at making a peanut butter cup tasting booze ball. It was harder to do than I first though. At first i tried using just peanut butter morsels, then I tried using peanut butter, then I found I had to mix them both so they could over come the chocolate and Bourbon flavors. Eventually I came up with the following recipe which I may tweak a little in the future but for right now I am happy with... Maybe I am happy with them because I have had too man of them and they are beginning to impaired my judgement! Either way I have really enjoyed testing them and hope you enjoy them as well! In a medium mixing bowl crush Nilla wafers either with a potato masher or by pulsing them in a food processor. Using a fork slowly mix in Bourbon until Nilla wafers are evenly moist. Now mix in Peanut butter until even. In a small sauce pan heat chocolate and peanut butter morsels over low heat until chips have melted, about 5-7 minutes. Whisk in heavy cream until smooth and then pour over Nilla mixture. By hand knead mixture in bowl until mixed well. Separate mixture into 12 even sized balls. Spread sweetened cocoa powder around in a small bowl. Roll balls one at a time in hands until smooth and then roll each one in the cocoa until coated well. Place balls as you finish them onto a nonstick cookie sheet. Once all of the balls are finished cover them with plastic wrap and freeze or chill in fridge until hardened (30-45 minutes.) Once hardened enjoy!